After a number of years of decline, the station re-opened in its current form in 1988. Can you believe that at one stage, they’d actually considered knocking it down and building an office block? What were they thinking! We thought it was one of the most beautiful buildings in Washington and we loved the way the space had been used inside for around over 100 shops and restaurants. Outside the station you’ll find a double size replica of the famous Liberty Bell, known as the Freedon Bell. 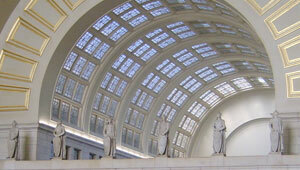 Address: Union Station, 50 Massachusetts Avenue NE, Washington, DC, United States.